Last week I began to tell the story of why ice has meant so much to the learning journey in our class this year and over several years. Before I sat down to write that post, I'd spent much of the weekend exploring the magnificent ice formations growing along the shore near my home, because the temperature at the time was in the -20 range with windchill values nearing -40. The deep freeze continued this week in school, thus we had several days indoors when the extreme cold meant outdoor recess was cancelled. By Friday, I couldn't wait to get outside and see the shore again. This weekend we've had snow, so much that the landscape is mostly white with trees, rooftops and field covered in white. Nearby Etobicoke Creek still flows under thick ice but it's nearly impossible to see. 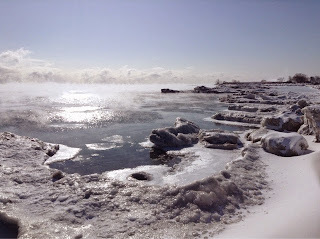 The beach disappears as the deep cold (-39 windchill) freezes waves into undulating shapes on the shore. This crack was the only sight of the wide creek rushing below the ice and snow. Back in the warmth at home, I thought about how our students got to where we are now, thinking deeply about how we learn. The year began with learning about our bodies, including our own "Best Part of Me" book. This is our first year of FDK at Thornwood PS, so there was new learning for all of us: the returning senior students who'd only had me for half-day Kindergarten last year, the new junior students for whom all school was new, for my wonderful teaching partner Pooneh who was new to Peel Board (and who I wrote about in a previous post), and for me, learning to share the learning with a teaching partner. 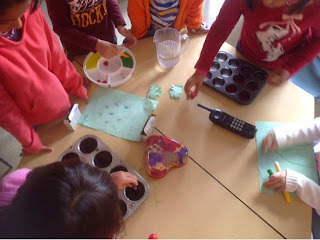 We weren't sure what inquiries might develop early on, so we both spent time getting to know our students through shared play and through group invitations. Much of our first month was spent outside, using a skill the seniors remembered well: "looking closely" at our environment to learn about what lives in our schoolyard. 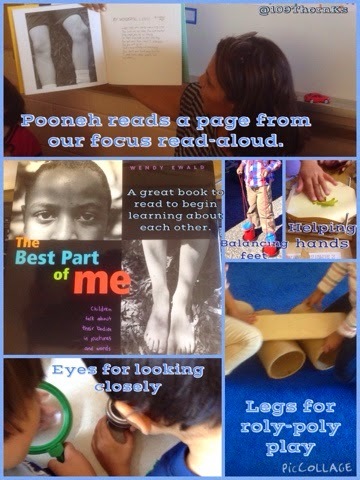 As our class began to settle into the new routines, Pooneh and I often split our large group into two, each taking half of the students to do a smaller circle exploration of materials or a read-aloud. Her ECE expertise was quickly evident to me as she created many sensory invitations to hone in on understanding particular parts of our bodies and our traditional "five senses". This book inspired us to create our own book of our"best part" pictures and stories. From there we rather naturally moved into health, both body and mind. Perhaps because so many of our inquiries flowed out of ongoing explorations, much overlap has occurred from project to project. Current inquiries such as body balance certainly link back to that first month's look at our bodies and what we love to do. The ongoing ice projects are certainly about the mysterious properties of frozen water and other materials through the lens of scientific exploration, but a secondary aspect of the long interest in one project is the way some students are developing metacognition about learning, perspective, and ideas. Ice continues to motivate deep thinking and joyful engagement in our class. 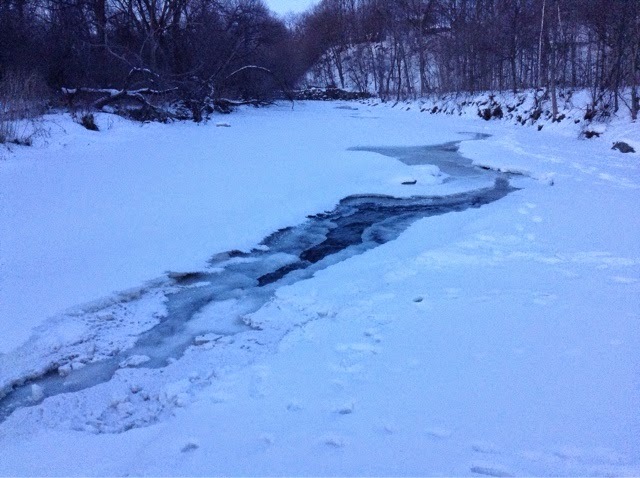 In part 1, I shared my own fascination with water in winter, and then how #iceinquiry began to unfold this year in class in late fall. I left off with a collaborative inquiry between our class @109ThornKs and my friend Kelly Wright's class @KinderWonders which inspired our students to incorporate colour into their designs. Kelly had continued to explore this with her class during that last week of school in December. What delighted me was to see how our collaboration was inspiring some pretty incredible thinking among her students as well. This spark happened right before the winter holiday break. I wondered as the holiday began if the interest in ice projects would fade away, with gifts of new toys and movies seen with family sure to bring new ideas to our conversations. 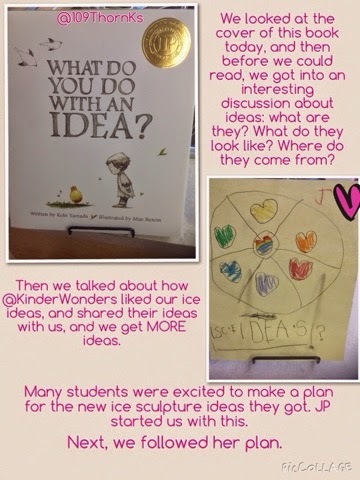 Not ready to move on from the exciting observations about ideas and learning that came up when our students commented on @KinderWonders creations, I brought a new book to share when we returned in January. The funny thing was, we didn't even open the book and read it, because the conversation that flowed once we looked at the cover was too rich! We saved reading to allow the students to share all the ideas bursting forth. 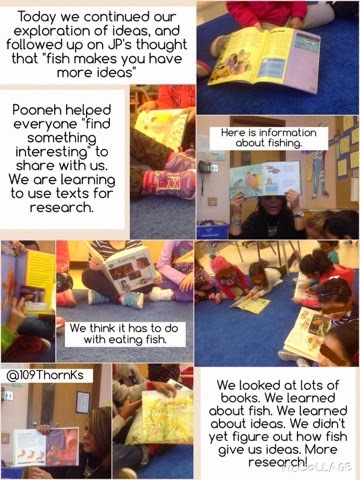 The story was captured in tweets by both myself and my partner Pooneh, as we share the @109ThornKs twitter stream. See the exciting week that unfolded when we asked: "What are ideas and how do we get them, anyway?" Note: some collages included in the slideshow are repeated in this post, as reading the small print can be difficult in the embedded storify below. Lime ice - a sensory delight that scented the room. Drawing plans and preparing sculptures for the freezer. Now seemed a natural time to explore ideas, thinking, and inspiration. The collages below (also included in the storify slideshow above but repeated here for larger viewing to read the print) represent an attempt to capture all the new directions our body and mind, and our ice inquiries were going to expand. When I look back at this documentation, I see what I was missing back in 2010 when I directed the students to all do a drawn and written response to our ice experiment. These days, I try to always let students know that next steps come from them, while ensuring time to reflect on what has happened and to ask questions generating new ideas. This has allowed me to see the students as capable learners whose curiosity and insight is the most important resource in planning experiences. What emerged from the conversation about "ideas" was incredible: thanks to the spark shared by JP at our welcome circle, the new way for students to create sculptures included drawing (and writing) detailed plans including the materials and tools needed for the project. When so many plans were drawn and created we ran out of space in the freezer, a space on the board was created, dedicated to "tomorrow's projects". 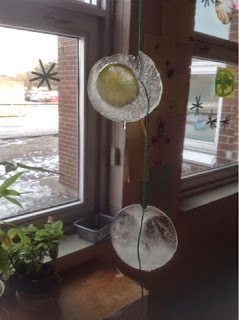 It wasn't yet cold enough outside to use the yard for our ice projects. That would come soon enough. 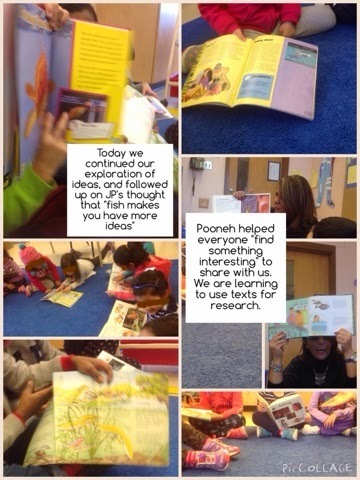 We also spun off into studying "brain food" due to the comment "fish is good for our brains", which lead a small group of students to join Pooneh in the library to conduct research into brains and ideas. On another level, we were learning how to conduct research, looking closely at information texts to glean what we could from words and pictures. This skill is one that our students will carry with them for life, and it emerged (as it often does) from deep interest in a topic that arises during a class conversation. The emergence of several new inquiries in our class in January (including a fire truck project sparked by the local Fire Fighters' visit to our school and an interesting look at gender and identity through toys) meant that the ice projects went hiatus for a few weeks. The learning thus far would have been enough for me to conclude that it was one of our biggest inquiries of the year. When it reawakened, however, the excitement surprised even me. 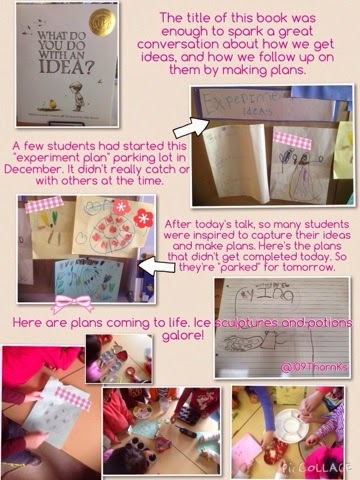 Our collaboration grew to include several classes and teachers whose communication with us helped our ideas grow. Indeed, the word "inspire" became a concept that spread to all we do in room 109. But that is a story for another post.